Madonna working on New Project/Album with David Guetta. This doesn't surprise me. I think they could do some good work together. Oh god, please not David Guetta! I'd much rather have another "American Life" than "Hard Candy." Same here. I didn't mind HC, but her AL sound was better IMO. Doesn't surprise me at all either, this seems to be natural coming after Oakenfold. Guetta remixed both "Celebration" and "Revolver" so it was obvious he'd submit tracks for her. Judging from this, I guess she'd enlist Calvin Harris and possible either RedOne or will.i.am to keep the "balance" between Euro and US. Well, he's kind-of...awful. But who knows - they may come up with something really good. Then again, I was hoping to say the same about "Celebration." But there's just as much chance that nothing will come of this anyway. Oh no. Not a good idea. Unless it's her way to exterminate mediocrisy from todays music industry. All those "famous" producers she has worked with got her kiss of death. In this case that's a good thing, I guess. I really am fed up of people complaining about her working with 'famous producers' as if, pre-Hard Candy, she only ever worked with people no one had ever heard of. If you actually bother to look at her career history she has worked with many of the biggest producers in the business throughout it. It's not so much their fame as their tired sound. i would love to hear her go alternative pop. like a NEW IN TOWN sound.....by that boots girl. I like his stuff, but he's getting kind of tired at this point. Maybe she's flirting with the idea of working with a bunch of different producers, and he's the only one bragging about it publicly. Or maybe she'd do half an album with him, and the other half with someone more underground. I hope its the first, the second could turn out to be either brilliant or a trainwreck. She's about a year too late. Again this seems like a desperate attempt to hook with the latest "hot" producer. I would prefer it if she teamed up with an up and coming producer. Someone a bit more underground. Am I the only one thinking that he was talking of Revolver? He wouldn't be talking like that about a remix that was already sent to radio stations. He also remixed "Celebration" that was posted on Madonna.com. Not to mention that I doubt he'd call remixing as a collaboration. Bingo. I'm not going to dismiss what she could come up with working with Guetta -I'm not wildly enthusiastic, but then again When Love Takes Over was one of my summer anthems. At the end of the day it's the SONGS. If the songs are there, and her voice is good, the production is secondary. Guetta is competent at least. No one is denying that. But her most exciting and memorable work was produced with the likes of Leonard, Bray, Orbit, Mirwais and even Price. All of them were more or less unknown to the general public (well, Price had some fame of Zoot woman and Les Rhythm Digitales). I think the "famous" ones she was working with on Hard Candy were too ego-driven to understand how you produce a Madonna record, to come up with something unique but instantly recognisable as a Madonna song. It appears to me their intention was to make people realize WHO produced her music. It's the biggest flaw of Hard Candy that it sounds like Timbaland, Timbelake and Pharrell Williams but hardly like Madonna. Too bad she didn't see or hear it. I actually hate the "When Love Takes Over" song and I wouldn't want Madonna to sing it, but to base your own judgement on the amount of people who were exposed to the sound Madonna takes, sounds like some elitist excuses to me. If you heard an unknown name, would you be 100% confident in the music even though you would know how it sounds? Like DJ Frank E, he did not produce a song alone before "Revolver" but he sounds like Bloodshy & Avant. I so hope this is not true. well i'm sad to say but then Madonna actually lost it. 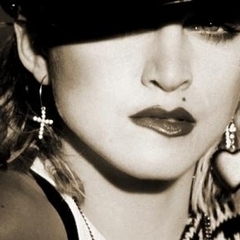 where the hell has the Madonna who had some sense of own style, originality and fresh-ness gone? I sooo miss her! I'm not gonna be one of those who will jump on the Madonna hate bandwagon or anything... and probably never will be... but plz Madonna... where did the creativity go!?!?!? True that, but we don't know when the interview was done - it can be like one month old and Digital Spy would not tell you that. He could have very well said "I would love to work with Madonna AGAIN" but he didn't. Possible, but remixing doesn't really need early stages, does it? He just sends in the remix and he doesn't need Madonna herself to ask him to do that. The interview also refers to new single which came out today in the UK. Anyway, even if he referred to Revolver, I'm still convinced he will end up submitting tracks for her new album, it's not a coincidence he remixed both Celebration songs.